What do Dragonlance, the Forgotten Realms, Al-Qadim, Spelljammer and Planescape all have in common? The answer: veteran author, designer and developer Jeff Grubb, who joins us to talk about world building and the joys of collaborative design. 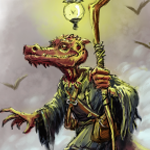 Jeff’s Open Design credits include ‘Joining the Noble Classes’ (Kobold Quarterly 2), ‘Secret Adventure Naming Tables’ (Kobold Quarterly 4), ‘Courtiers of Zobeck’ (Kobold Quarterly 9), ‘The Blood Oasis’ (Six Arabian Nights). Halls of the Mountain King is the current, ongoing, Open Design project. Senior Patron Brandon Hodge gave his perspective on patronage, his contributions to the development on Halls, and what he’s learned about game design. Also Mentioned: Big Top Candy Shop & Monkey See, Monkey Do! Clinton J. Boomer is known for his contributions to Paizo’s Pathfinder books. We spoke with him about monster design, and how he goes about bringing new critters to life for our gaming enjoyment. 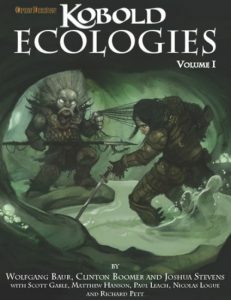 Boomer’s Open Design credits include ‘The Ecology of the Half-Giant’ & ‘The Ecology of the Retriever’ (Kobold Ecologies), as well as numerous articles on the Kobold Quarterly website. Heard about this via Monte Cook on twitter. Just finished listening to it on my walk. Good stuff! Keep up the good work. I will be back for more. Great job! Especially liked hearing from Jeff Grubb. Great show Mr. Nemesis. It’s a great workout companion! Keep em going!